Recover your official file, financial documents and other valuable data from Mac hard drives and different type of USB removable devices. 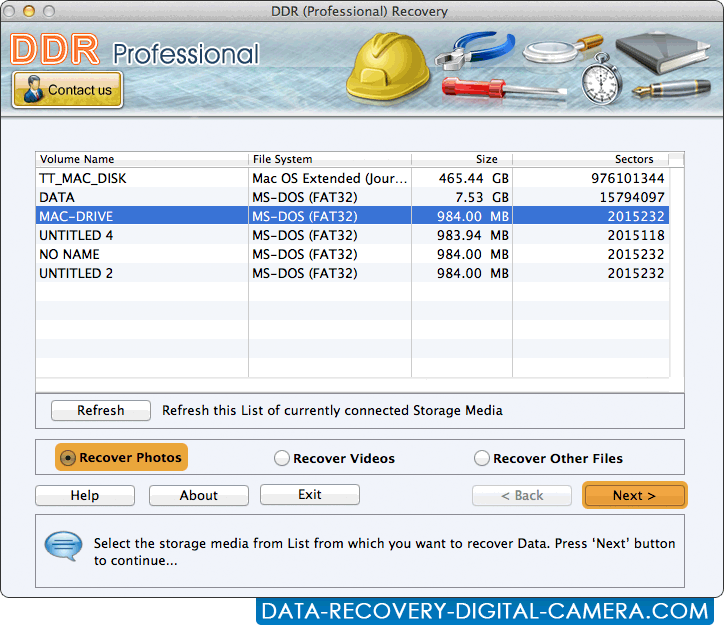 Mac Data Recovery for DDR Professional software recovers entire accidentally deleted text files, official documents, mp3, mp4 songs, video clippings, digital photographs, images, photographs and other crucial data from Mac hard disk and different types of USB removable devices. » Accidental deletion of files. » Formatted disk volumes, Bad sector in disk. » Partition table corruptions, Operating system failure. » Improper system shutdown, Frequent power faults and other similar data loss reasons. MAC restores unintentionally deleted digital photographs, cute baby snapshots from flash removable media drives. Recovers lost wedding photographs, birthday images without affecting their originalities. Software provides facility to display preview of lost digital images before their actual recovery. Restores missing photos, your precious moment’s pictures in less time. Application provides attractive GUI interface so that non technical users can easily operate the software without facing any problems. Supports picture recovery from Hard disk drives, Memory cards, USB drives, Mobile phones and more.